Beyond ABCs: Can school give kids a lifelong love of learning? 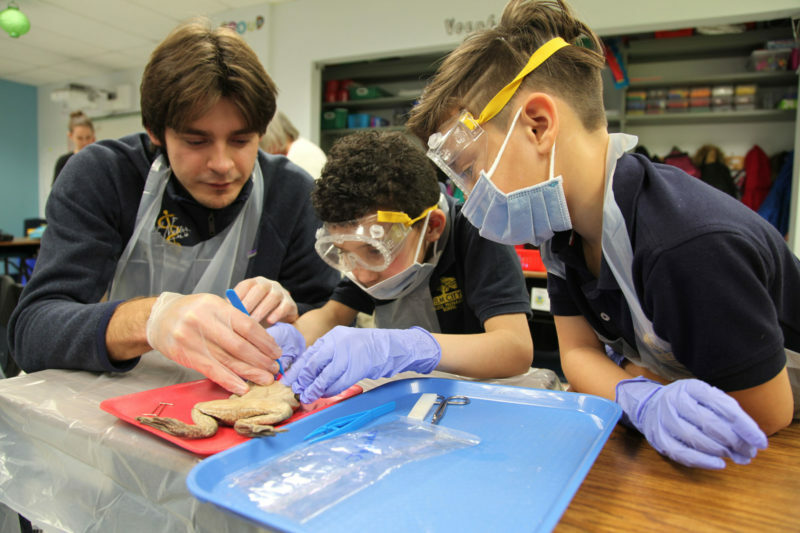 NEW HAVEN, Conn. — The third- and fourth-graders at Elm City College Prep, clad in protective goggles and facemasks, studied their preserved frogs with the seriousness of med students facing their first cadaver. They had practiced the dissecting procedure in an online interactive, and now they were ready to raise real scalpels and get a look at the frogs’ insides. Cayer knows how they feel. She felt the same thrill when she was a young girl and her doctor dad showed her how to dissect a frog. Back then she could imagine no greater joy than accompanying him on his rounds. Curiosity opened up a world of options and potential careers to her. Now she wants to ensure that her students experience that sense of possibility. How do you encourage that kind of curiosity and passion in kids, and the persistence to follow where it leads? The Greenfield model uses some rather commonplace strategies, such as integrating online learning, small-group instruction and greater parental and community involvement. Where the model pushes boundaries is in the addition of learning experiences called “expeditions.” These are not field trips. They are two-week intensive courses that take children outside the classroom and beyond the traditional subjects. Expeditions aim to impart what Cayer learned by being around her father: a habit of pursuing expertise or passion, or both. 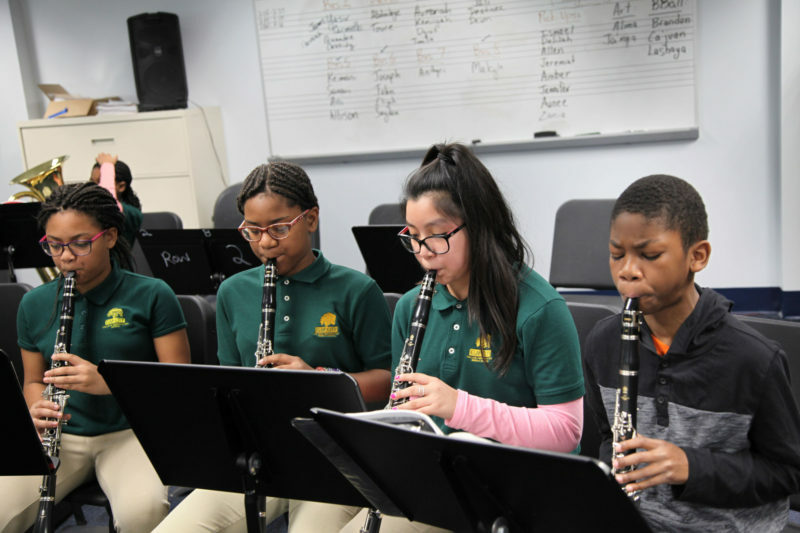 Elm City requires that students take expeditions three times a year; they are taught by professionals and immersed in fields like journalism, orchestra, theater, dance and medicine. Students become interns of sorts, and are encouraged to pursue their curiosity — even in unexpected directions. Such pursuits are increasingly unusual in today’s standardized testing culture, especially in schools that serve low-income populations (roughly three-quarters of Elm City children qualify for free or reduced-price lunch, a standard measure of poverty). Achievement First was responding to what co-founder Dacia Toll describes as a wake-up call in 2013. The charter network’s New York students had scored below expectations on the new, more challenging Common Core tests. But the more startling problem was that the charter network didn’t seem to be fully preparing its students for success beyond high school. College completion rates for their graduates were between 30 and 50 percent, well above the 14 percent national average for low-income college goers, but not up to the network’s own standards. Toll sees expeditions as a way to give students what they need for that long-term achievement: strong academics, content that motivates them and the chance to work independently as well as collaboratively toward a goal. The hope is that expeditionary learning will solve a problem that has long bedeviled charter schools like Achievement First: graduating kids who then find it difficult to work independently in college and who eventually drop out. 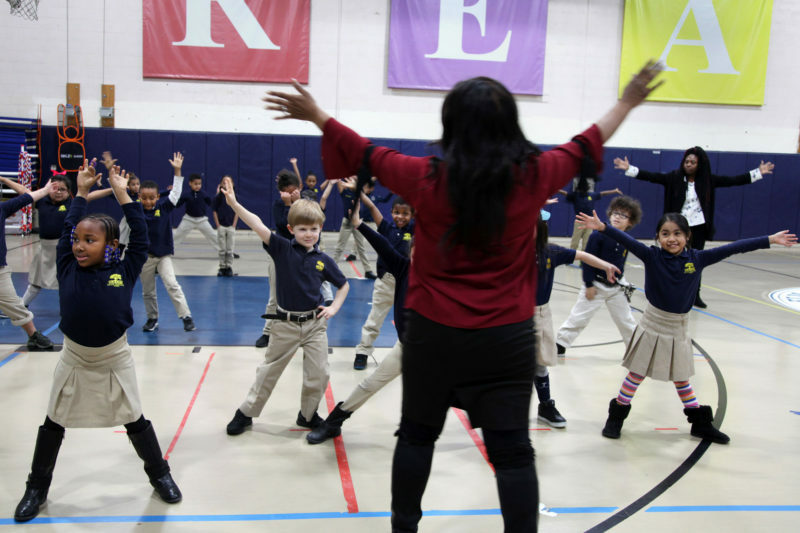 What students need, some education experts say, is a powerful incentive to keep going. During the Elm City expeditions, such persistence was evident. Children encountered problems and were driven to find solutions. 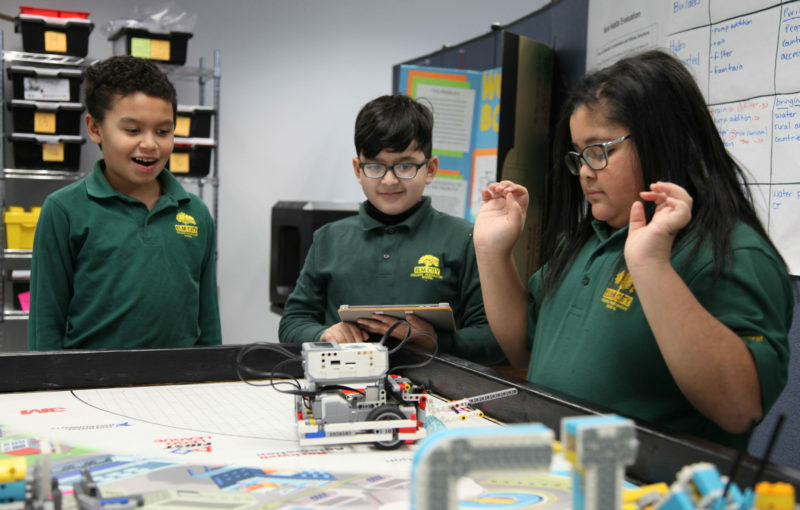 In a Lego robotics expedition, fifth- and sixth-graders hunched over iPads trying to figure out how to make their robots move. A group of three appeared to be frustrated. When their robot finally sprang to life, they looked at each other as if they couldn’t believe it. Their robot ended up crashing into the wall, but they’d been emboldened by their minor success and got back to work. In the mini-med-school expedition, students practiced suturing banana skins and putting casts on mannequin arms that Cayer bought on Amazon. As much as possible, she structures the expedition after real medical schools, assigning kids specialties, like cardiology. On “rounds,” Cayer presents them with scenarios to act out. A “doctor” might have to diagnose a patient with high blood pressure, identify the symptoms and decide which steps to take next. After the expeditions, students have a “showcase night,” demonstrating what they’ve learned for parents. During a recent showcase, some mini-med-schoolers took parents’ blood pressure, while another team of doctors-in-training explained what to do if it becomes elevated. An impressive display, but will kids carry these lessons into the future? That’s what Kristina Zeiser of the American Institutes for Research wonders. She agrees that expeditions can motivate kids and boost academic engagement. But her research hasn’t shown that they teach self-management and persistence. Related: “Deeper Learning” improves student outcomes. But what is it? Achievement First’s leaders believe that they’ve designed a model of schooling focused more on preparedness for college and life than on acing a math or reading test. I hope you will also begin to look at seeing some environmental variables/tools which can help more students and older students have more hope for changing and improving their lives. I feel our current, genetics models are hurting both the current, higher achieving students and the many more students who are not nearly as supported from a young age. 1. One important idea would be redefining our average stress as "many maintained layers of mental work" which take up real mental energy, leaving less mental energy for more abstract, creative thinking. This idea sees many maintained layers with situational problems or events going on top of those layers. By teaching students with more cognitive understanding how to more permanently reduce those layers to continually change and improve their lives. This means much more hope than our current genetics models are offering our students. I feel higher average layers forces students to work much harder to receive the same mental reward, and yes, hurts both long-term motivation and accumulation of skills necessary for more complex learning. Also, the pace of intensity in approaching mental work can hurt learning and motivation. As our pace and intensity in approaching a mental work exceeds our current mental frames or knowledge and experience, we hurt our learning and motivation more so. Sadly the higher our average layers the more this feeds automatically feeds into improper pace and intensity. We can teach the proper dynamics to all students to help reduce those layers and improve long-term motivation. I hope we can help all students have more hope for continued change and improvement over time. Much more on this.